Research interests include instructed second language acquisition, intercultural communicative competence,teaching language and culture as situated and integrated practices, empathy, representations and stereotypes, experiential learning, and the integration of technology in language learning/teaching. Current research projects include developing an experiential simulation for French for Business courses and eliciting learners’ subjectivity and positive emotions through website design. Drewelow, I. & Finney, S. (2018). Developing intercultural empathy through a strategy-based simulation in intermediate Spanish. The Language Learning Journal. Drewelow, I. (2017). A socio-constructivist approach to developing intercultural empathy. In S. Dubreuil & S. L. Thorne (Eds. ), Social pedagogies and entwining language with the world (pp. 255-265). Boston, MA: Cengage. Drewelow, I., & Mitchell, C. (2015). An exploration of learners’ conceptions of language, culture, and learning in advanced-level Spanish courses. Language, Culture and Curriculum, 28(3), 243-256. Drewelow, I. (2015). Liberté et République: Using familiar constructs to cultivate learners’ awareness of diverse perspectives. The Language Educator, 10(3), 48-50. Drewelow, I. (2015). Developing cross-cultural awareness at the introductory level through stereotypes and digital storytelling. The French Review, 88(3), 71-90. Drewelow, I. (2013). Exploring graduate teaching assistants’ perspectives on their roles in a foreign language hybrid course. System, 41(4), 1006-1022. Drewelow, I. (2013). Impact of instruction on shaping or reshaping stereotypical cultural representations in an introductory French course. Foreign Language Annals, 46(2), 157-174. Drewelow, I. (2012). Learners’ perceptions of culture in a first-semester foreign language course. L2 Journal, 4(2), 283-302. Drewelow, I. (2012). Twitter in the teaching methods course: Foreign language graduate teaching assistants’ perspectives. Paper accepted for publication. The JALTCALL Journal, 8(2), 129-143. Drewelow, I. (2011). Learners’ selective perceptions of information during instructed learning in French: Consequences. Modern Language Journal, 95(s1), 27-41. Drewelow, I. (2011). 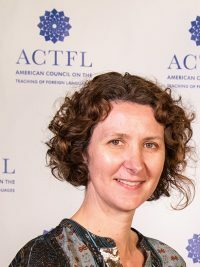 American learners of French and their stereotypes of the French language and people: A survey and its implications for teaching. The French Review, 84(4), 748-762. Drewelow, I., & Theobald, A. (2007). A Comparison of the Attitudes of Learners, Teachers and Native French Speakers about the Pronunciation of French: An Exploratory Study. Foreign Language Annals, 40(3), 491-520.